The L-Series, or is that Leak-Series? RIM's upcoming, fully touchscreen BlackBerry 10 handset looks like it's been snapped again, and this time the photos are actually pretty good. We've seen previously leaked pictures claiming to show the L-Series handset, but quality has been the usual level of blur – but now Tinhte has got hold of clearer images. Apparently coming from Vietnam, the pictures once again show the handset which has appeared in previous leaks, but this time we're able to get a proper look at what is potentially the first fully touchscreen BB10 device. The device isn't switched on so we can't be sure it's running BlackBerry 10, but there are still a number of points to garner from these snaps. First up is the rather chunky bezel which adorns the top and bottom of the phone, which adds extra length to the device – think iPhone 5. Round the back there are slots for a microSIM and microSD card, both of which will be hidden by the rear cover, with the latter accessible without having to remove the battery. There's a camera lens and flash hiding in the top corner, while on the right sits the play/pause toggle – similar to the switch on top of the BlackBerry PlayBook. 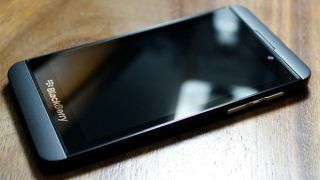 Connectivity fans rejoice, as according to the snaps the BlackBerry 10 L-Series handset will sport NFC technology as well as microUSB and microHDMI slots. RIM is keeping quiet on its upcoming handsets, and while it is happy to tell us it will be launching full-touchscreen and a QWERTY keyboard handsets on January 30, no further details are being revealed.